I invited readers to share their thoughts and memories about Neal Patterson following his death Sunday. I’ll keep this page updated with new submissions from the guestbook form and from my LinkedIn post comments. Neal Patterson had great vision and will be missed. Neal Patterson was controversial in and out of Cerner. He pushed a lot of buttons and sent many an executive on a high-speed-wobble. He was a hands-on executive with a vision that held true for decades. I always looked up to Neal as someone who used his vision to craft an entire industry. For those of us old enough to remember, he was doing clinical computing when clinical computing wasn’t cool. It wasn’t easy to sell clinical applications to CFOs who ruled IT back in the 80s and 90s, yet Cerner always prevailed. He created a clinical software and services company that did revenue cycle, unlike his peers who grew up during the gold rush of revenue cycle dominance a couple of decades ago. His vision that eventually the revenue cycle would become subservient to the core of patient care, where the patient is treated and where medical knowledge resides, proved true as the industry moved to his vision allowing Cerner to become a dominate healthcare companies in the world. Healthcare can be flaky as a business. Companies come and go as our government shifts policies and changes funding. Few companies have the patience to survive the waves of change. Neal was a one-of-a-kind who saw a future in healthcare and was unwavering in staying the course, even when the course was hard to see through the fog of regulatory uncertainties we’ve experienced over his professional life. I had the pleasure of working with and for Neal for 16 years (not directly). Neal was a visionary. He was brash and intense and at the same time one of the most down to earth and loving people I had the opportunity to know. Neal was passionate about leadership and about culture. He was passionate about innovation and interoperability. Because of his amazing leadership, Cerner will be a place where I am proud to be for another 16 years. We are changing healthcare for the better with our clients and that, in the end, will be Neal’s legacy. I bumped into Neal at the Cerner Health Conference one year and made him laugh with my impersonation of an Irish presenter at CHC. He seemed like a hard-driving yet friendly guy. 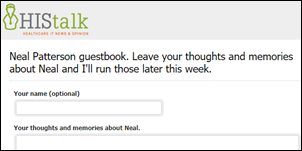 As a Cerner customer, I had the opportunity to meet Neal on several occasions. I can say without a doubt that he truly wanted to improve the care of patients. One can argue the pros and cons of how he went about that, but I don’t think anyone should doubt that his ultimate goal was to improve the patient’s experience and outcome. Neal Patterson was brash, arrogant, and aggressive. Yet despite some of his less admirable personality traits, we have to admit that he did reshape the healthcare IT industry. Neal took a relatively small lab company and changed it into an innovative, expansive, and formidable enterprise. By changing Cerner, he inadvertently changed all of his competitors who designed, developed and sold hospital information systems – whether we knew it, or even liked it, we became better vendors because of Neal. I’ll never forget his full-page picture in the Wall Street Journal. And, yes, “tick, tock” — time runs out for us all. Rest in peace, Neal. Neal was one of the smartest people I ever met and one of the greatest business minds of any founder/CEO of any industry, let alone healthcare. I met him when he was taking the young lab IT company to a new level with an inpatient system and Cerner was installing it in a brand new hospital in Edinburgh, Scotland. I was supplying the cardiology and patient monitoring stack with Marquette. We made an attempt to buy Cerner after that — you can imagine how long it took him to turn us down. Later, after starting Picis, we met again and I told Neal that he wasn’t getting the market credit for the complete rewrite of his codebase which was well received by customers. He listened to people and he started to pitch that to the analysts and the stock appreciated quite a bit. Though we eventually became quasi-competitors, Neal would personally stop by the Picis booth every year at HIMSS — once with a young associate who he said to in front of me, “Watch this company.” I took that as a great measure of pride and respect. Neal built a great team — the Cerner culture is one of a strong sales culture backed by execution and delivering. From his partner Cliff to Paul Black, Trace Devanney, Bill Miller, Mike Valentine, and Zane Burke today — all are leaders in Neal’s image. They know because while being a bear to work with/for, they all came away with great leadership skills. The people I’ve hired out of Cerner know how to get things done. Look at the tremendous same store sales record Cerner has had with its customers over the years as a testament. When you look back over your career and think about leaders that made you better, anyone that has worked with Neal would have his name high on their list. The healthcare informatics industry is better because of Neal and the leaders he has supported, coached, mentored, and pushed over the years. Neal has seeded this industry with some of the best and brightest leaders in this industry, including Paul Black, Mike Valentine, Bill Miller, and Zane Burke. His legacy and his vision have been left in good hands! Rest in peace, Neal. We will continue to pursue your vision. I had the good fortune of working for Cerner for 16 years, half of it in the early days. When Neal would begin to spin a tale of the intersection of health and IT, it was spellbinding, engaging, dramatic, motivating, and above all, about improving the quality, dignity, capability, and humanity of all involved in the endeavor. He has been an inspiration, a motivation, and mentor for many of us. But to me, he was the guy — the leader — the reason to work in this industry. He will be sorely missed. His ideas will live on in the next few generations wherever health is impacted by IT. Although I didn’t know Neal Patterson at all, his name and company were well known to anyone in the industry. I was fortunate (or so I think!) to have joined the HIT industry around 17 years ago and still laugh at some of the crazy things vendors did back in the day to convince docs they needed to get on the bus. I really enjoyed reading the HIT eulogies from others in this industry who have also been a part of this movement, both leaders and others like me who were just blessed to be a part of the movement. It was interesting to see who added their thoughts, as well as those who didn’t. That being said, Neal Patterson won’t be the first or last to leave the planet, but I want to thank him for all the things he did to keep this HIT stuff moving forward. Thoughts and prayers to NP and his family! RIP Neal Patterson. Healthcare IT is such a difficult place to do business in, and on top of that, to have a vision and look into the future. Not many people have that. Always amazes me that it all started on a bench in a park. Visionary and a true leader. Neal, you will be missed. My deepest condolences to the family friends and colleagues of Neal. He was a true visionary that helped to transform the delivery of patients, families, and communities world wide. His spirit, passion, and vision has helped all of us drive for improvement. A healthcare game changer and warrior is no longer with us. Neal Patterson has been an icon, a mentor in the industry, and will be remembered forever. I have been in this challenging arena of healthcare IT for almost 2½ decades. Challenging only because of the constant changes that forced all of us to constantly adapt and re-invent ourselves. I have faced some challenges as an ally to Neal, and some on the other side as competitors. We won and lost some battles together and as competitors. The challenge is what made it fun and Neal’s brilliance made us think harder to stay in the game. The most important thing is that we were always driven by our shared mission and passion to do the right thing for our customers and the healthcare industry. The customers and the industry always won! Neal’s Cerner was an adventure ride unlike anything Disney had ever imagined. Being on the front lines and having a court-side seat while executing his vision to transform an industry was daunting, crazy, fun, unpredictable, and, above all, incredibly rewarding. 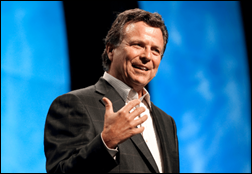 For the hundreds of alumni who have gone on to run businesses, the lessons we learned and experiences we gained from Neal Patterson eclipse the most prestigious MBA one could earn. We vision using white boards, we are never comfortable with status quo, we give ‘pen-raised’ youngsters opportunities beyond their current experiences, and cringe at the words vendor, customer, or employee. I smile when I think of Neal in Heaven. His new associates will be certain to have their vision statement ready to be recited at a moment’s notice, they’ll absolutely have a riveting question to ask during the Town Hall and, by all means, they’ll know to stay low when a debate gets especially lively. Neal was truly an amazing person that never forgot his roots. From the moment I met him, he made me feel very welcome and supported. Like most farm boys, he did not expect people to address him as Mr. Patterson or anything formal. Instead, he would insist that you just call him Neal. I had the privilege of working closely with Neal for many years and gained invaluable professional experience while also getting to know him personally. Make no doubt, whether in the professional environment or personal, Neal was competitive and encouraged and expected excellence. Those years were packed with many late nights, early mornings, … and fun. Neal would joke that when he was around, others had more fun, but it was a reality. I also got to see the personal side of Neal, which was a very compassionate and caring person, something the business world unfortunately often overlooks. My hope is that we (not just Cerner, but this industry) continue to do what is right for the person, the patient … us. Let us all be compassionate, caring, empathetic, and make “one last round after sundown” in honor of Neal. Because after all, Neal (and many before him) proved that in the end, health care is personal. Neal made each of us better. He may be gone from this place, but his legacy lives in each one of us. Let’s make him proud!